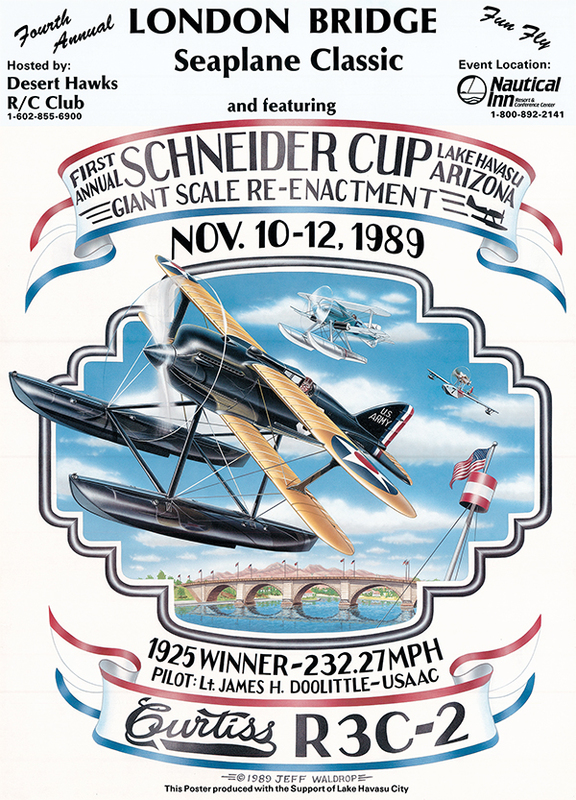 Late in 1987, after the Desert Hawks’ successful second London Bridge Seaplane Classic, Bob Martin and Norm Goyer (Editor of Scale RC Modeler) over dinner, began discussing the possibilities of a RC event unlike anything ever staged in this country. Because of the friendliness and co­operation Bob had received from the community of Lake Havasu since he moved his business here, and in a way to give something back to the community that has close ties to London, England, Bob suggested the possibility of a Schneider Cup event. Norm Goyer, being the scale buff and historian, he is, jumped at the idea. As they discussed the event, they decided that it was to be a Giant Scale event. The larger aircraft fly more realistically, are easier to see and are just down right impressive. Bob had years of experience in promotion and Norm had the magazine in which to give this new idea a great deal of publicity. Bob, working with the Desert Hawks RC Club in Lake Havasu City, began to formulate and plan for this event. Rules had to be formulated and plans had to be made for an event that had never been attempted anywhere in the world. Forming a committee of fellow Desert Hawks members, many hours would go into designing and presenting this unique event. Five of the members spent hundreds of hours designing and building a Schneider Racer to use for promotion. Their choice was the 1925 winner, the Curtiss R3C-2 flown by Jimmy Doolittle. The choice was very logical, it was American, flown by a famous American racer, and it had two wings! The huge 1/3rd scale replica appeared in over 10 magazines worldwide prior to the event and was a tremendous asset in the promotion. It was sold prior to the event so it could be entered and flown. The Desert Hawks did not feel they should compete with this aircraft in an event where they wrote the rules, hired the judges and were the host. The Curtiss did compete and finished 3rd and will be back again in 1990 to try to improve on that finish. With Scale RC Modeler’s great effort, the co­operation of other magazines, the dedicated work by the Desert Hawks RC Club members, the financial assistance from the City of Lake Havasu, and the co-operation of the Nautical Inn Resort, a truly great new event was created. Already ranked as one of the top five scale events in the world after the first year, the future of the SCHNEIDER CUP RE-ENACTMENT™ and ones like it seemed very bright.